Ever wondered what that “furry feeling” was on your teeth when you forgot to brush this morning? The answer is plaque. Plaque was once believed to be a non-specific accumulation of saliva, food debris and other detritus left on your teeth surfaces after eating. Now, after many years of intense research it is known to be a highly complex and very active microenvironment made up oral fluids, protein matrix and hundreds of thousands of bacteria from as many as 300 different bacterial species. 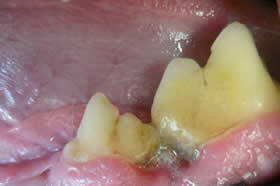 2) periodontitis – where inflammation and gum detachment and bone recession occurs. Both diseases are directly related to the pet’s immune system responding to the presence of bacteria in the plaque. The immune response leads to inflammatory changes which, combined with the presence of destructive ezymes, toxins and bacterial by-products, results in deepening of the periodontal pocket, gum recession, bone loss and loose teeth. These structural changes around the tooth lead to a deteriorating cycle of events with plaque spreading deeper onto the root surfaces, increasing bacterial populations, more severe inflammation and further gum recession and bone loss. 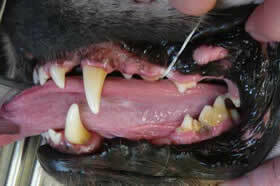 Surveys suggest that 4 out of 5 pets over the age of 3 years have some degree of gum disease.! When did you last look inside your pets mouth? Dog. Pre-dental. Dental health does not appear too bad. 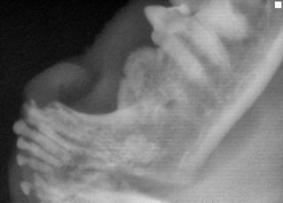 Closer inspection of lower premolars – not looking so good! or does it? After scale and polish – significant gum recession and root exposure! Bad breath is the most common effect noted by owners. However, this is often only the tip of the iceberg. The gums become inflamed, which leads to areas of pain within the mouth (periodontal disease can affect specific areas within the mouth – it is not necessarily a whole mouth disease) and bleeding. This may show as reluctance to eat, dropping food, drooling, or even vocalising when eating. The roots may become so severely affected that some teeth become loose and fall out. Each time a pet with periodontal disease eats food the chewing action leads to the gums being compressed or massaged in a cyclic manner. This leads to liberation of very large numbers of bacteria which gain access into the blood stream due to the increased inflammation in the gum tissues. This bacterial “shower” places enormous demands on the body’s immune system and, as recent studies suggest, leads to increased inflammatory changes or disease in organs such as the brain, heart, liver and kidneys. 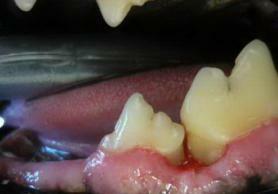 There are two very important steps in diagnosing periodontal disease and assessing the severity of the condition. 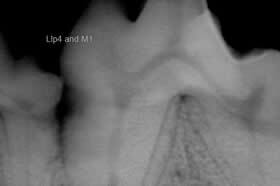 Dental radiography. This is essential in assessing whether the supporting alveolar bone around the teeth has been affected by the periodontal disease. If these two steps are not taken during a professional dental treatment then the job is not being done properly and significant disease can be missed. Doing a thorough dental treatment does involve a full anaesthetic. This allows us to completely examine the mouth, chart changes, and XRays. Doing dentistry without anaesthesia is dangerous and causes more damage than benefits. Here at Halifax, all cat dentals involve full mouth dental X-rays. In our canine patients we strongly recommend Xrays as well. Even if your pet’s teeth look normal on examination dental X-rays can detect disease below the gum line – up to 30% of dogs and 50% of cats!!! Our digital dental X-ray system makes oral X-rays quicker, easier and of much higher quality! 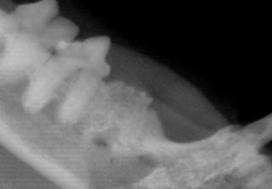 Dental X-rays are one of the most important diagnostic tools available to a veterinary dentist. They allow the internal anatomy of the teeth, the roots and the bone that surrounds the roots to be examined. A dog’s lower left premolar four The rear root and lower premolar 2. Bone loss evident around a cat’s lower jaw showing feline osteoclastic resorptive lesions (FORLs) associated with the canine tooth. Cat lower jaw showing a destructive FORL of the canine tooth and premolar 2. The roots have been totally destroyed. Prevention is better than cure! The best way to treat periodontal disease is to prevent it in the first place. The gold standard for achieving this is no different to our own oral hygiene practices – brushing! If you brush your pets teeth daily you will dramatically reduce the chances of periodontal disease occurring. Brushing is ideally started in young pets so you can get them used to it as part of their normal daily life. Many adult dogs can be trained to accept brushing but some just don’t want to play the game. Cats fit this category too. It is difficult to get cats to accept brushing. We must often rely on other preventative strategies for these pets. You are what you eat! There are diets that are specifically designed to reduce plaque and tartar. Hills Oral Care® and Hills t/d® diet are two such diets that really work. They are designed to squeegee or scrape the tooth surfaces during the chewing process and have been clinically proven to reduce plaque and tartar in dogs and cats. Chew toys, chew treats and drinking water additives such as Aquadent® can all be very helpful in reducing plaque accumulation. As mentioned above plaque becomes mineralised with calcium salts within 48-72 hrs therefore brushing needs to be done no less frequently than every second day. Less than this and you may as well not start. Prevention of the most common oral disease in pets (and in people!) consists of frequent removal of the dental plaque and tartar that forms on teeth that are not kept clean. The Veterinary Oral Health Council (VOHC) awards its Seal of Acceptance to products that successfully meet pre-set criteria for effectiveness in controlling plaque and tartar deposition in dogs and cats. The VOHC is an entity of the American Veterinary Dental College. If you would like information on products that will help control deposition of dental plaque and tartar on the teeth of your pet, click Veterinary Oral Health Council website.